Description: Tea is different from the other witches in her family. Her gift for necromancy makes her a bone witch, who are feared and ostracized in the kingdom. For theirs is a powerful, elemental magic that can reach beyond the boundaries of the living—and of the human. 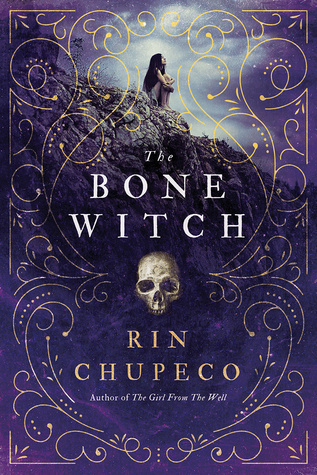 Review: The best way I could describe The Bone Witch would be a mash-up between fantasy and Memoirs of a Geisha. While an original concept, I had a really hard time getting into this book. It read as a very long prologue as this is clearly the first book in a series. Tea is an asha, known for performing, fighting, and magic. Ashas are revered for their talents yet treated as outcasts and feared by their kingdoms. Tea stumbles upon being an asha when she accidentally raises her dead brother Fox. The narrative is split into two timelines. The past timeline details Tea’s early training as an asha and the future timeline shows a hardened, cynical Tea on a lonely beach raising monsters and planning war, relating her past to a nameless bard. I didn't mind the back and forth timelines as they were easily to distinguish the two and I also found the world building confusing but fascinating as the author combines several Asian influences into her book. I also liked the concept surrounding the heartglass which dictates a person's emotions and intentions. The book is very slow pace and I mostly skimmed much of it as it could not hold my attention. We are told in the beginning about a dark force descending upon Tea's people, however, we don't hear of it until the last 100 pages in the story where all the action seemed to happen all at once. There is surprisingly very little magic performed in the book which I found disappointing. I also found some of the secondary characters such as Fox and Tea's mentor to be much more interesting than Tea herself. Tea was stubborn and headstrong and there were a few times she came across as very young. I really liked Chupeco's debut novel, The Girl from the Well, and I will keep an eye out for what she writes in the future, however, I struck out with this new series and don't plan to continue it. Words of Caution: There are some disturbing images. Recommended for Grades 7 and up. I have read nothing but lackluster reviews for this one. It sounds so promising, but everyone including you complain of the slow pace. I am definitely skipping this one. Little magic and slow pacing? This one sounds interesting from the synopsis so it's too bad it doesn't live up to its potential. I love the cover but will have to pass on this I guess.